Consistent presentation of sales, promotions, and up-sell prompts combine to increase order value (on average 20 – 30%). Labor and transaction cost savings are realized through customer-driven sales transactions. Restaurant team member contributions are being re-focused into other phases of guest services; including more team members on kitchen throughput, drive thru, and table delivery of initial orders and drink refills. 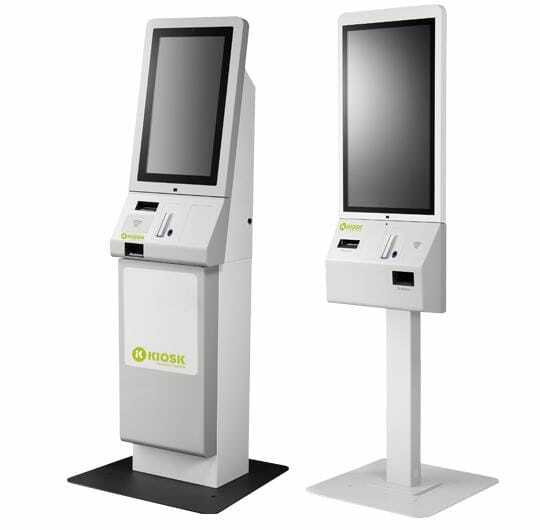 KIOSK and our Taiwan-based Parent Company, Posiflex, have teamed up to provide a modernized order entry portfolio to provide modular footprint options. 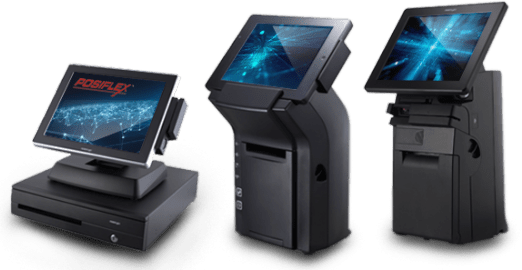 With the Paragon and Stellar Series, Series, KIOSK offers pedestal, wall mount, and countertop platforms to provide greater placement flexibility within deployment locations. Cash and EMV compliant card payment options are available to maximize transaction security. The Paragon Model is a newly released 32” kiosk, available as a single or dual-sided pedestal and can also be deployed as a wall-mount. The 32” PCAP display has risen to the forefront of popularity and is the most widely deployed form factor among major chains. The Paragon’s freestanding or space-saving wall-mount maximizes flexibility, making it a natural mainstream choice for self-service kiosk restaurant deployment demands. The Paragon Model is a new interactive self-order entry retail and restaurant kiosk purpose built for quick service and fast casual restaurants, as well as retail stores. It serves as a natural extension of existing POS terminals, helping to drive sales and accelerate customer flow at peak times. Designed with both functionality and aesthetics in mind, the Paragon TK-3200 Series features a bright, high definition 32” PCAP touch screen and sleek, durable enclosure, providing a contemporary and sophisticated user interface. This large format is quite popular for restaurant touch screen ordering systems. The Paragon is a modular design that can house a variety of payment device options. Modular design makes installation, maintenance and component replacement easy and convenient. Most of the highly reliable components in the Paragon are produced by KIOSK’s parent company, Posiflex, in Taiwan. Posiflex components are known for long life-cycles and high reliability, reducing service costs over the life of the deployment. The Paragon series is designed by KIOSK in the US and manufactured in Taiwan. Inventory stocking and final configuration are performed in the US for fastest lead time. The unique supply chain leverage in place for this series enables us to provide exceptional quality at a very attractive price. The Stellar Model is KIOSK’s countertop offering for self-service ordering. This model features a 21” PCAP display for a more compact form factor, with configure-to-order payment device options. Both the Paragon and Stellar models are designed by KIOSK and manufactured in bulk from Taiwan, for attractive lead-time and price point efficiency. Because labor and manufacturing costs are much less expensive in Asia (vs. U. or Europe), we are building both Stellar and Paragon in Taiwan to leverage volume build efficiency and achieve the best possible price in each global region of distribution. Both Paragon and Stellar units will be stocked in regional facilities globally for final configure-to-order finish work, where customers can define their preferred payment components and optional add-ons. By stocking these base configurations, KIOSK and Posiflex can provide best-in-class lead times to global distribution channels. Both the Paragon and Stellar hospitality models are modular and can be broken down for shipping. This design element enables us to ship the kiosks in boxes on a pallet for final assembly at location, which is much more cost effective than shipping fully assembled. Because far more can fit in an overseas shipping container, this eliminates overseas shipping costs as a price barrier. Regionalized final configuration is initially available in the US, Europe, and Taiwan. Contact us for more information on order entry kiosk solutions. Since the Posiflex acquisition of KIOSK in 2016, the ties between the two companies have grown, and so have our product lines. As industry leaders in both point-of-sale and self-service platforms, we are expanding and cross-pollinating solution offerings, bringing added value to retailers and greater execution caliber. The links here will direct you to Posiflex’s website and sales team for expert advice on the POS line.